"CRAFTSMANSHIP ALONE IS NOT ENOUGH"
That’s the title of an upcoming exhibition at Central St Martins (University of the Arts London) next year. It surveys the history of the ceramics course there – now one of the few ceramics BAs left in Britain. It has an illustrious history, led in the mid-20th century by Dora Billington and, after she retired, by her deputy Gilbert Harding Green, who was just as innovative in his teaching. Central St Martins, which moved into old industrial warehouses a few years ago, seeded a new quarter of London, on what had been derelict railway lands for seventy-five years. It’s an exciting place to visit. The campus extends to the British Library and the newly-founded Crick Institute of life sciences. There are plenty of bars and restaurants, and for those on a limited budget, I can recommend the student canteen at the Central. Ceramics has been taught at Central Saint Martins for over 100 years. In 1919 Dora Billington instituted the first taught curriculum at the then Central School of Arts and Crafts, moving the subject on from classes in china painting and decoration to one of the most important courses in the country by 1955. Today it is one of the two remaining ceramic specialist degree courses in the country, and the only one with an emphasis on design. Billington embraced the idea of industry in opposition to the “dilettantism” she believed her contemporaries, such as Bernard Leach, stood for. This position, uniting art and industry, has framed ceramics at Central Saint Martins ever since. Mixing together work by alumni and current staff and students, Craftsmanship Alone is Not Enough celebrates this rich history, demonstrating how the course continues its role as leader in material and design education now and onwards into the next 100 years. 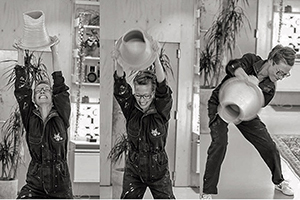 The exhibition will reflect the embodied practice of working with ceramics, with an active studio built in the gallery space as the setting for demonstrations and live clay firings, igniting imaginations with the possibilities of clay. Here’s a link to the full description with opening times and details of how to get there.